Embattled investors singed by the performance of the equity and financial markets in 2008 may want to look at more tangible assets to invest in going forward. In such an unpredictable environment, one of the most tangible of assets is property, especially for more conservative investors who are looking for steady but unexceptional returns. That leaves the question of when and at what price point investors should acquire properties, assuming that more gloomy economic and business data are still on the way which may have an effect on consumer sentiment and therefore, negatively impact property prices. Those in the property industry, from developers to agents, will tell you that any time is a good time to buy property, especially if purchasing to stay because there is a probability that postponing a purchase may result in that particular property becoming unavailable or becoming pricier. On the other hand, now may be the time to conserve cash and wait for opportunities, even for those who are looking to upgrade. For those who are investing for returns, that is a more difficult question to answer because launch prices have not plateaued although secondary market prices have fallen. Property industry experts will tell investors that prices have not risen by much in the country compared with Singapore while falling secondary market prices may be due to any number of factors including location, accessibility, amenities and the number of new units coming into the market in any particular location. 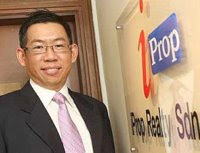 iProp Realty Sdn Bhd managing director Victor Lim says investing in commercial property is always a safe bet. “If you look around, there are fewer good commercial properties compared with residential properties, so they can command a premium,” he tells StarBizWeek. He says compared with residential properties, business tenants are a more stable source of income. “Tenants in residential properties have a tendency to move whereas business tenants will stay longer,” Lim says. He says the general rule of thumb is that the investment must yield at least 6.0% gross return before it can be considered. However, prime locations will also have better capital appreciation. “I’ve a client who invested RM1.6mil in a shopoffice in the early 2000s in Desa Sri Hartamas and sold it last year (2008) for RM3.2mil,” Lim says. He says investors may not wait even when times are bad. “Another client who has been eyeing a plot of land in Puchong bought it for RM2mil cash, sometimes investors just have to seize the opportunity and wait it out,” he adds. Lim says another way to diversify a property investment portfolio is through purchasing real estate overseas. “Those who buy abroad do so for a number of reasons, maybe they’re buying with an eye to migrating or maybe it’s for their children’s education,” he says. “I know a number of my clients have started to look at properties in the US and Australia because of their attractive prices. They cashed out of the local property market early this year and are now looking at the US and Australia, at least one of them is serious about the US,” Lim says. On the other hand, Hartaemas Real Estate Sdn Bhd marketing manager Bernard Yong says that for the year ahead, condominiums in prime locations are still a top pick. However, he says a good time to invest in property is probably at the beginning of the second quarter of 2009. “I’m looking at Mont’Kiara condominium units, at prices between RM500 psf to RM600 psf,” Yong says, adding that Bangsar is another alternative. He says launch prices have not come down but developers have become more creative at selling. “They’re giving more incentives or more creative financing,” Yong says. He says secondary market prices for residential properties in Mont’Kiara, KLCC and KL Sentral have been affected with the KLCC location being the most speculative. “From next year till 2011, there are between 8,000 to 9,000 condominium and serviced apartment units becoming available in the KLCC location where demand for units of 1,000 to 1,600 sq ft has been healthy but the larger units are unsold,” Yong says. He says that while properties closer to the Petronas Towers may not see any drop in prices, there may be a stagnation of prices for newer projects. “Those looking to buy into the location may see opportunities there,” Yong says. Have some cash to invest? Three experts were asked what would be the best way to invest RM50,000 and below are their responses. First of all, we need to know what is the purpose of the savings? Is it for short-term use? Medium or long-term usage? Our money should be allocated into three portions: liquidity, profit and security. Usually, money in the liquidity portion is meant for short-term use. The money allocated for the profit portion is mainly for investment, hedging for higher return (either to re-invest in business, the share market, etc. ), whereas money allocated for security purpose is meant for long-term use such as retirement, long-term care, education and lifestyle. For liquidity purposes, which is mainly for the short term, it usually involves savings accounts, current accounts, fixed deposits or short-term income funds. The ideal ratio of funds to be utilised is 20% for liquidity, 35% for profitability and 45% for security. Of course, the ratio is different from time to time and from one individual to another. While making the allocation, it is a must to re-visit or review other essential planning such as a healthcare plan, family income protection plan, future income protection plan, critical illness coverage plan, debt cancellation, mortgage protection plan and mortgage review, life insurance and estate planning. Before making any decision on the RM50,000, we need to identify the end in mind to avoid any disappointment. First, we have to review and identify what other financial resources we have and only then proceed with the plan. In conclusion, after checking and reviewing your personal cashflow, this is not only the RM50,000 that we should plan for but it could involve the ongoing securing of wealth from your yearly surplus in order to ensure wealth preservation and accumulation for the future. For a better picture of the entire planning, it is always advisable to look for the capable financial adviser. Investing RM50,000 over a period of six to 10 years. There are a number of financial instruments that yield higher than the fixed deposit and give a reasonable return of 7%–9% a year. ·Investment-linked single premium with a reputable life insurance company. Equity funds have shown to generate 8% to 10% return over a period of seven to 10 years but there is also the danger of a market crash where you may end up poorer. Bond funds give a lower return and are safer. Real estate investment trusts (REITs) have recently sprung up and with quality buildings and high rental rates, a fair income can be assumed and reasonable returns could be expected. ·Unit trusts have been in the scene for quite some time. Most of them are life insurance or bank-backed organisations and they have also shown consistent returns. ·Structured products have recently come into the scene. Insurance companies and banks have moved into cash on low fixed deposit rates. As the experience is still in its infancy stage, we will have to wait to see if they perform well. My recommendation would be to invest in investment-linked single premium product. Half of the RM50,000 can be invested in bonds and the other half in equities. We should aim to get real returns of about 5% to 6% after deducting the inflation rate if our objective is to protect of our savings value from being eroded in times of high inflation. In the long term, however, we expect interest rates to moderate to about 2% to 3%, hence we would target to obtain about 7% to 8% in gross returns. The financial instrument to achieve this would be unit trusts of different asset classes. We would usually invest with about four to five different fund managers as well as varying asset classes as a form of risk diversification. Despite the volatile market situation, it is possible to achieve notable returns in these investments provided we invest for the long term, generally more than five years. It is also important to review our investment portfolio every six months and restructure according to the market’s performance. Depending on one’s life stage, it would be necessary to plan for expenses as well as insurance before investing. It is also crucial to have a timeframe in mind when investing. For example, if we are planning for our retirement in 20 years’ time, we would target higher returns at the beginning by investing in riskier asset classes. We would then gradually move to less riskier forms of asset classes as we near our retirement.